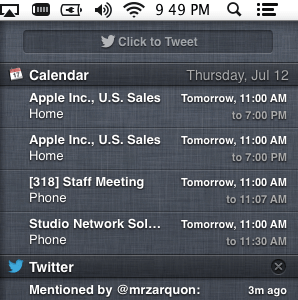 Show in Notification Center: Indicates the number of items for each app that are shown in the Notification Center at a time. The default is 5 and this shows you, for example, the subject, sender and first few lines of emails or the name and sender of Tweets that have information about you. Badge app icon: Removes the red indicator for each app. For example, when unchecked for mail you’ll no longer see how many unread emails you have. Play sound when receiving notifications: Enables an audible alert (ding, ding) that a notification is waiting for you. Overall, I think it’s really awesome that I now have a feature that is very iOS-centric sitting right here on my Mac. I do think it’s a bit verbose by default, but then, that’s my workflow – the developers are probably targeting the people who feel multi-tasking is healthy on every single computing device you touch. I don’t necessarily agree, but I dig it anyway. So me and my 2 apps that still have notifications enable are going to use this feature, if a bit less verbosely than most! 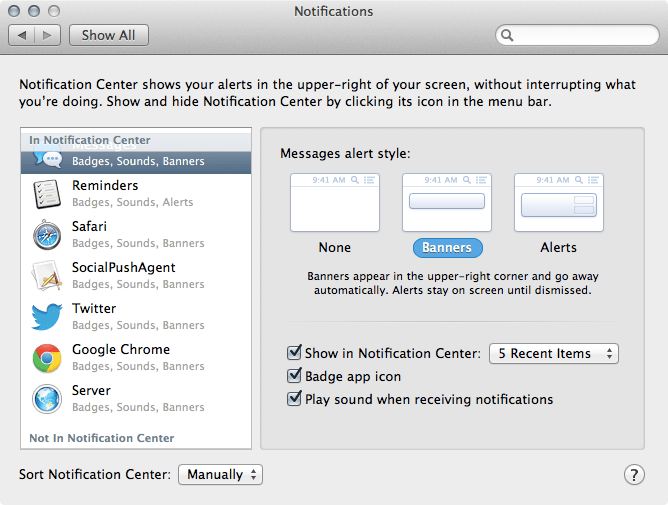 A good way to put notification center out of your way (at least for a while) is to command-click on the notification center icon. It will not display new notifications (at all) for a predetermined time.